I love books. I love the feel and smell of the paper. I love the adventures I can find within the pages, hidden stories waiting to be discovered and new characters to meet. I get overwhelmed at times in libraries and book stores (although some of my favorite places) because there are so many choices, so many pages to flip through. Even now that I own a Kindle, I feel a rush of excitement when I get an email notifying me that my library book is available for download (the free Overdrive app connects me to my local library for lending). I was a book nut as a child too. Reading was my favorite escape from the craziness around me – school, teenage drama, boy crushes, family, friends and more. As a very shy child, reading allowed me to slip into other worlds where I could picture myself brave, outgoing and confident. I still find books to be an escape for my adult life at times, which is probably why I enjoy fiction books. I like mysteries, romance, political thrillers, historical fiction, chic lit and more. You may be aware that March is National Reading Month, which is a perfect excuse to read as much as you can (if you ever need an excuse, which I don’t!). I was very honored to be asked to be a mystery reader for my nephew’s Kindergarten class last week. I had to provide five clues for the students to guess who the reader was (my nephew said he guessed me after two clues. I guess “I love horses” gave it away!) and bring one of my favorite children’s books to read. 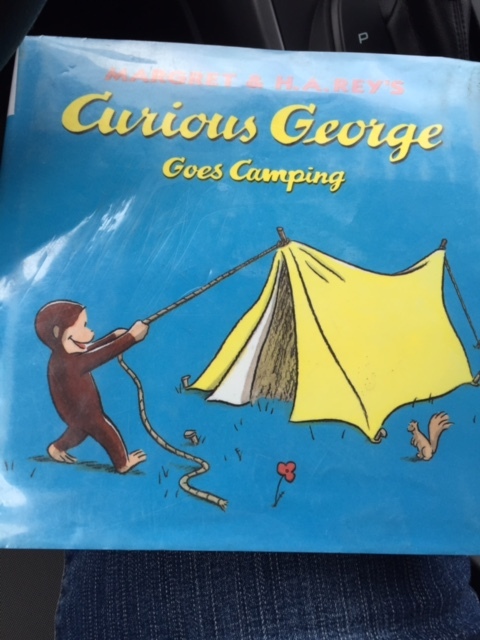 I have a lot of favorites but ended up with Curious George goes camping because I do love taking my nieces and nephew hiking in the woods. In honor of National Reading Month, I thought I’d share some of my favorite books from my childhood. Curious George (Margaret and H.A. Rey) – The world’s most mischievous monkey easily steals the hearts and imaginations of children in this ongoing series. The little monkey has lots of adventures and is usually rescued by his friend, the Man with the Yellow Hat. 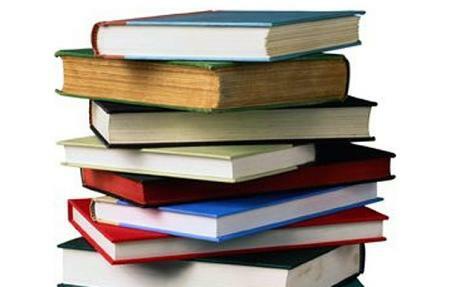 More than 30 million books have been sold throughout the world! The original authors were married, with Margaret the main writer and H.A. the illustrator. I’m glad that the series continues on after their deaths (thankfully the ghost writer keeps the style true to the original), ensuring other generations will know this timeless monkey. Berenstain Bears – Another married couple, Stan and Jan Berenstain, brought this lovable bear family to children. This series is probably one of my absolute favorites. I love reading these books to my nieces and nephew, or any child willing to listen! As a child, I loved the adventures and stories in each book. As an adult, I love the lessons taught in the book and the value of family. Boxcar Children (Gertrude Chandler Warner) – This series focuses on four children, two brothers and two sisters, who lose their parents, find their grandfather and end up in lots of adventures. I read the original 19 books when I was younger, but other authors have added to the series (Gertrude died in 1979). I still remember going to the library, so excited to find the next book in the series on the shelf (and sometimes disappointed if it wasn’t there). Sweet Valley High (Francine Pascal) – This series centered around identical twins, Jessica and Elizabeth, and the drama, events, friendships, crushes and more that occur during high school. In all, 152 books were written in the series, although I don’t think I read all of them! There was also a series published, Sweet Valley Twins, which was a prequel focusing on the girls in middle school. Baby-sitters Club (Ann M. Martin) – Baby-sitting was steady income for me during middle and high school years so this series appealed to me in middle school. The plots center on a group of young girls who form a business (‘The Baby-Sitters Club”) of baby-sitting. The various books focus on different issues the girls face in life and baby-sitting. The Baby-Sitters Club is one of the best-selling book series in history, selling more than 170 million copies worldwide! Dr. Seuss books – I liked the silliness of the subjects and learning fun words and rhymes in each book. 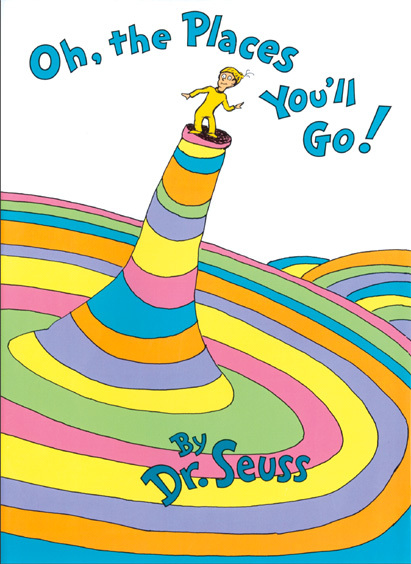 My favorite Dr. Seuss book is still Oh, the places you’ll go! This book can apply to so may situations and serves as a great gift for graduates. I received a copy from my oncology team after my final chemotherapy treatment. It fit the situation so well. Dr. Seuss’ birthday, March 2, is the annual date for National Read Across America Day, an initiative on reading created by the National Education Association – a day I fully support! The Saddle Club (Bonnie Bryant) – It’s probably no surprise this series falls onto my favorite books list since you’ve read about my love of horses in previous posts. I couldn’t put these books down once I started! The series follows the adventures of three young girls who ride at Pine Hollow Stables. Every book has a horse focus, although school, family, friendships and other topics are a focus at times. I actually just discovered there was a television series about these books, which I admit I’ve never seen. What were your favorite books during childhood?